Sometimes being a reporter is as complicated as just paying attention to where you are. New impressions stand on the shoulders of everything you’ve learned before and create something fresh. Between the interviews and appointments and places we had to be, Sunday ended up an “unbooked” morning in Havana, so I went to church. It was a little too far to walk, so I stepped out the front door of the historic Hotel Nacional de Cuba and caught a cab. Not just any cab, but one of the cabs set aside for foreigners and tourists, who pay in Cuban Convertible Pesos, one of the two currencies Cuba has in circulation and the only one used for tourism. The cathedral of the Cuban Episcopal Church, Holy Trinity Cathedral, is a spare, spacious building in what looked to be a pretty affluent neighborhood at the time it was built. The church could hardly be seen from the street for the profusion of foliage covering the wrought iron fence. After being greeted warmly at the front door, I took a seat. The service followed the Episcopal style of worship found in American churches. There was no ornate stained glass. There was no organ. Three church ladies belted out songs from the Cuban hymnal on their own, and were joined with brio, by the congregation. The sermon was an interesting mix of learned Anglican tradition and Cuban volubility, running about twice as long as a sermon in the United States. A cool tolerance for organized religion has developed in Cuba in recent years. The hostility of the early Revolutionary period has mellowed, and the joyous congregation surrounding me came in every color of the Cuban rainbow. Apart from the Rev. Wilfredo Benitez, visiting from St. Anselm’s Episcopal Church in Garden Grove, Calif., I wondered if there were any other foreigners there. As the collection plate passed, I dropped in a gift of the only currency I could have, Cuban Convertible Pesos. The plate was full of Cuban pesos, the daily currency used by the average Cuban. I admit I hadn’t been paying enough attention on the cab ride to the church. When the service was over, and after a friendly greeting from Fr. Benitez, a NewsHour fan who wondered if that guy who looked like Ray Suarez out in the pews really was, I headed resolutely and confidently out the door in the wrong direction. But the Sunday morning streets were interesting. People were relaxing on their porches, going to the market for lunch, or just taking a stroll and greeting people from the sidewalk. I pushed on, hoping for a landmark, or a glimpse of the ocean that would help orient me toward the hotel. Finally, when a guy asked me for a light, I told him I didn’t have one and asked if I was headed in the direction of the Hotel Nacional. Nope. The prospect of catching a tourist cab out in the neighborhood I had walked into was slim. So I asked my new friend, Antonio, to point me in the right direction. He said he worked in the laundry at a Havana hospital. He had a brother living in Washington, D.C. He was surprised to run into an American on his street. What was I doing in town? How long would I be in Cuba? He was congenial company. But I had to get back to work, and I was now much too far away from my room to walk back. Did he know where I could get a taxi? No, but he had a friend who could give me a ride back to the center. So we strolled through the neighborhood until we found him… since he was taking me in his own car, rather than a licensed taxi, would I mind getting out before the hotel and walking the last block? No, I said, not at all. The price was four convertible pesos. We struck a deal, but I only had a 20 convertible peso note. Since my driver had no hard currency it was impossible to break a note that large. Antonio had an idea. We could head for a hard currency store, buy him a beer, buy myself a bottle of water, and make change for the ride to the hotel. Was I being hustled? Maybe a little. But Antonio had no other way to get the hard currency needed to buy that beer. A beer and a peso and a conversation with a foreigner were an enjoyable distraction on a quiet Sunday morning. The ride in the 22 year-old Moskvich, a Soviet-made car, was a trip in both senses of the word. The interior had long since lost whatever padding it may have had. A piece of sheet metal shielded the front seat passenger from the inner guts of the door. A bent piece of metal moved the window up and down. A hard piece of black plastic tied to a piece of rope opened the door. The driver was about to have what for a Cuban was a very profitable morning, and it was only going to take 15 minutes. 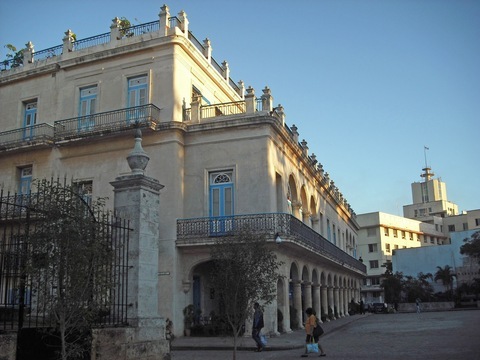 He had been to Washington, New York, Boston, and several cities in Canada during a tour of the Ballet Nacional de Cuba. His wife had been a dancer, and he made himself useful on the trip, and got to see a bit of America during the 70s. He liked Washington, he said, not as crazy as New York, and very pretty. He popped the stick into neutral and rolled to a halt half a block from the hotel entrance. We struck our small blow against currency controls, and parted friends. A professor now teaching at Baruch College of the City University of New York, raised in Cuba, told me she had watched Cubans change as economic hardship persisted from the 90s into this century. The suspicion of materialism, the nationalistic pride when encountering foreigners, was eroded by the sheer difficulty of making a living. When I was here in the 1980s, many Cubans I met would turn down a tip for doing a simple favor. It was their pride that the Revolution had provided well for them, and the outstretched palm was not a feature of their daily lives. Yet back then the gap between those who lived in the Cuban peso economy and those who lived in the hard-currency was only beginning to widen, and the vast gulf that exists today could never have been imagined. The Soviet Union was subsidizing daily life by paying a wildly inflated price for sugar. Even as the Cold War was in its final chapters, it was hard to foresee that the dissolution of the USSR and years of crisis in Cuba were just around the corner. In that era my guide Antonio might have only enjoyed the experience of chatting with a foreigner, rather than trying to monetize his brief encounter. It was an interesting morning, and really has me wondering where Cuba goes next. Read Ray’s first post from Cuba, ‘Getting Reacquainted with Havana’, and view some photos from his trip.